As I suspected, the book starts by recounting the starting of Nike and how it managed to grow into the behemoth that it is today. Unlike most modern day technology companies, where the process seems to happen in five years or so, the growth of Nike is a slog. It was a battle of will and determination, and it clearly shows how the company became what it was due to the persistence, perseverance, and, at times, the obstinate nature of Knight himself. Throughout this portion of the book, Knight does an outstanding job telling the story. It feels more like a suspenseful thriller rather than a biography. Of course, you know how the story will end, but it is still a page turner wondering how Knight managed to overcome the seemingly insurmountable obstacles that were consistently put in his path. It was interesting to learn the history of Nike and to see how close to the edge of bankruptcy the company was consistently run until it went public. Given the number of near death experiences the company encountered, it’s amazing it was able to grow into the company it is today. It gave me a new found respect for the company, even though I would not consider myself one of their loyal, or even fair-weathered fans. Thankfully, Knight focuses nearly the entire book on the building of the company. 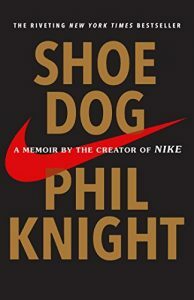 Yes, there are some places toward the end where Knight comes to the defense of Nike’s policies, but these are treated as more of a footnote and lessons to be learned, which don’t detract from the book and story of Nike the company. The book was a borderline Must Read for me, and I’ve decided to put it into my Fun Read category. I would highly recommend it to every entrepreneur or person looking to start a business. It’s important to understand the value of persistence, and to recognize two key traits of Phil Knight that made Nike successful: 1) the ability to make decisions without fear of being wrong and having complete information; and 2) taking action. While I would agree that luck played a major role in the ultimate success of Nike, it was also the hard work of Knight and his team that put it into position to capitalize on those situations when luck appeared. Those that attribute any company’s success purely to luck fail to recognize that fact. Luck alone will not lead to success. It also takes hard work and persistence to put the company in the right position to take advantage of luck when it appears. Finally, the afterword written by Knight may be the best part of the entire book. It was great to hear him explain how important relationships are in business, and the deserved recognition he pays to those that helped Nike achieve its tremendous level of success. All in all, I’m glad I read Shoe Dog, even if it wasn’t one of my preferred genres or book formats. It goes to show that you have to keep an open mind and be willing to try things out occasionally, especially when they come highly recommended by those around you.